A new group is working to stop clear cut logging in the Pioneer Valley's biggest area of protected open space. The activists want to do that by persuading politicians to convert the 87,000 acre Quabbin state forest into a national park. Of that area, 58,000 acres is land, the rest is water. Stopping logging on the land would make it more profitable for logging companies to buy forestland that might otherwise be turned into houses, roads, Walmarts, and parking lots. Logging companies can be required to log sustainably, not using clear cut logging. This kind of rule exists in Vermont. The USA is losing an average of 6,000 acres of open space every day, according to www.tpl.org/ourland. On October 13, about 40 people met in Shutesbury, Massachusetts, which borders Amherst and the Quabbin forest. They were deciding how to create a Quabbin National Park. “Acadia National Park is 48,000 acres,” Michael Kellett told the Valley Post in a telephone interview on October 14. He spoke at the meeting. According to a September 5 article in the Lowell Sun daily newspaper, Kellett was a “key player” in the creation by President Obama this summer of the 87,400 acre Katahdin Woods and Waters National Monument in Maine. Logging is banned in national monuments and in national parks. The difference is that creating a national park requires an act of congress; creating a national monument does not. “There were people at the meeting in Shutesbury who want to attend a rally for this issue, others want to call their elected representatives, others want to do non-violent civil disobedience,” Kellett said. Kellett is the director of a group that has a web site at www.restore.org. He is also employed by a group that has a web site at www.GlenCanyon.org. One model for how to protect open space comes from California. Some of the redwood trees growing near Eureka, California are more than 2,000 years old and more than 300 feet tall. Many people who have stood in silence among these trees, in the fog that often blows in from the nearby Pacific Ocean, have later said they felt like they were in a sacred place. In 1996, the world’s biggest privately owned ancient redwood forest was in Carlotta, near Eureka. The nearest big city is San Francisco, a five-hour drive to the south. The 3,000 acre forest, known as Headwaters, was owned by the Texas-based Maxxam Corporation. Maxxam’s CEO, Charles Hurwitz, had said his employees would begin logging in Headwaters on September 16, 1996, the first day allowed by federal endangered species laws. The Headwaters forest is in Humboldt county, California. In 1996, the Times-Standard, published in Eureka, was the only daily newspaper in the county. On September 20, 1996, the newspaper’s then-owner, Thomson Newspapers Corporation of Toronto, Canada, announced it was selling the Times-Standard to MediaNews Group Corporation of Denver, Colorado. The article about the upcoming rally quoted only the Maxxam spokesperson, the pro-logging Republican governor, the county sheriff, another county official (talking about problems he believed the protesters would cause), and a spokesperson for the federal Department of the Interior. There were no quotes from any of the organizers of the protest. In its Thursday issue published before the Sunday rally, the Guardian published an unsigned editorial, “Saving Headwaters.” The author summarized the standoff between Hurwitz and government negotiators, then wrote, “So it’s looking like the fate of Headwaters will be in the hands of activists who have vowed to take whatever action is necessary, from protests to civil disobedience, to block the chainsaws.” The same issue of the Guardian included details about the rally, and contact information for rally organizers, to make it easy for any reader who wanted to go. KMUD is a commercial-free, listener-supported community radio station which can be heard from Mendocino, California to the California-Oregon border, a 250 mile-long, mostly rural area. KMUD airs the daily news program, “Democracy Now!” The station produces its own daily, 30 minute local news program, which airs at 6 p.m. every week night. In the weeks and days leading up to the Headwaters rally, KMUD broadcasted extensive coverage of the issue, and frequently announced the time and location of the rally. Four days before the rally, the station devoted 23 minutes of its 30 minute daily local news program to coverage of Headwaters and the rally. Most of this coverage was produced by Estelle Fennell, the news director at KMUD. A September 5, 1996 KMUD News report about Headwaters, produced and read by Fennell, included an interview with activist Judi Bari who said, “People’s presence at this rally is going to make a huge difference.” Fennell then said, “Rally organizers have been meeting with Maxxam, the sheriff’s department, the California Highway Patrol, and CalTrans [the state agency that managed the road alongside of which the rally was held] to make sure everything will go smoothly.” This information would have been reassuring to listeners, especially ones with young children, who were trying to decide whether to go to the rally. Similarly, a report broadcast on KMUD News on September 9, 1996 by reporter Betty Miller included an interview with rally organizer Naomi Wagner, who spoke directly to listeners who were considering risking arrest for non-violent civil disobedience at the rally, “If you give police your name and show your ID, you will be released the same day…. We encourage everyone to come to the nonviolence training sessions we are offering. You will learn a lot and it will be fun.” The reporter then read over the air the times and locations of the training sessions, and a phone number that people could call for more information. 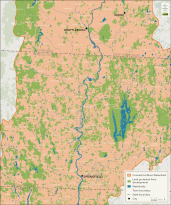 The below map of the Connecticut River watershed in Massachusetts, southeast Vermont and southwest New Hampshire shows that the vast majority of the farmland and forestland is vulnerable to being converted to houses, roads, parking lots, and Walmart stores and similar commercial buildings. The map was current as of 2015. Click on the map to enlarge it, then scroll down and click "see full size image." Then click on the map again to enlarge it more. You can move the image using the arrows on your keyboard. Submitted by Anonymous on Wed, 11/02/2016 - 09:24. Great read. I hope they continue to make some headway on the Quabbin project. I think that is a must for Western Mass. These logging companies come in and make huge messes. Submitted by Anonymous on Tue, 11/01/2016 - 17:20. Quabbin National Park: Sensible Idea or a Cockamamie One? “Mass Forest Rescue Campaign and RESTORE the North Woods will team up to sponsor Michael Kellett, Executive Director of RESTORE. Michael Kellett has been working for 30 years to restore and permanently protect wilderness and wildlife, benefitting the health and well-being of nature, people and climate. RESTORE played a critical role in laying the groundwork for President Obama’s recent designation of the Katahdin Woodlands and Waters National Monument, protecting over 87,000 acres next to Baxter State Park in northern Maine. In the past couple of weeks, I have been communicating with an assortment of civic leaders, foresters and environmentalists in the North Quabbin region and not one has shown enthusiasm for a Quabbin National Park. Most are sharply critical of the idea, and I will be quoting from some here without using their names as these were sent to me via email and Facebook, and I try to adhere to some internet etiquette about privacy. As for me, I am troubled by the anti-logging screed in the publicity for the Oct. 13 meeting. Although I proudly call myself a tree-hugger, I know I live in a wood house with wood furniture -- and I respect managed forestry. I do not respect unrealistic extremists who weep and wail because they see a photo of an acre or two of cleared state-owned land, unaware that foresters approve some logging to remove diseased trees or to enhance habitat. Bruce Spencer of New Salem, now retired, is widely respected for the work he did as chief Quabbin forester. If there are problems with his successors, these can be resolved within the Commonwealth. An assortment of social justice and peace organizations based in the Pioneer Valley have endorsed the park proposal, but what’s missing from the list is more significant. The state’s three largest environmental groups – Mass. Audubon, The Trustees, and Sierra Club are not there, nor are any of those based in the North Quabbin such as the Athol Bird & Nature Club, North Quabbin Trails Association, Mount Grace Land Conservation Trust and Millers River Watershed Council, nor is any town conservation commission. I wonder how many of the people promoting the plan have been on the reservoir or its protected land, or even have visited local towns such as Athol, Orange, New Salem, Barre, Ware, Hardwick and Belchertown? Call me skeptical! I will be unable to attend the Oct. 13 event due to travel plans, but if this intrigues you, please go and send me an email with your impressions (allenyoung355@gmail.com). Submitted by Anonymous on Wed, 10/19/2016 - 17:00. Submitted by Anonymous on Wed, 10/19/2016 - 07:05. They do make a mess in there with the way they log, and I've seen logging right next to vernal pools.